You get our point; it is almost impossible for us to view our bodies as vast networks of cells and molecules, much less as webs of interacting particles and waves. However, the beautiful mystery of nature is that at our most fundamental level, waves and particles are exactly what we are. In grasping this reality, our problems are ones of perception and scale, for in the course of our everyday lives it appears that particles and waves have no relevance to us. However, as quantum physics reveals, everything is connected—the world is a vast web of interconnected relationships. We compartmentalize ourselves at our own risk. For example, where once we thought the body was machinelike, regulating itself independently of the mind, research now has proved that thoughts, beliefs, emotions, and attitudes profoundly influence the functions of our cells, organs, and immune system—processes that are vital to our health and overall sense of wellness. Science has birthed a new mind-body medicine, and we can no longer deny that such immaterial aspects of ourselves as thoughts, beliefs, hopes, and desires can change the chemistry of our bodies. We can no longer afford to ignore the web of relationships that determine just about everything we are on a physical level. With this new frame of reference, we can begin to seek an even deeper understanding of our bodies and our health. We are motivated to find the mechanisms, processes, rules, and relationships that define and determine our state of being. Through the work of innovators such as Peter Fraser,” we can being to peel back the different aspects of the body like layers of an onion, moving from the macro to the micro scales, and then even deeper to the subatomic scale. What we find is a radically different body at each level. The deeper we go, the less substance there is to the body. Tissues and organs give way to molecules and atoms, which, when you probe deeply into their nature, give way to fuzzy clouds of subatomic particles, some real and some virtual, with those virtual particles popping out of nothingness and returning there after only a whiff of existence. As we probe into the subatomic realm, we find that the brain, blood, and bone of the body give way to invisible forces, fields, and particles whose interactions underlie not only the human body but all of matter. Molecules give way to atoms that dissolve into subatomic particles, so that our bodies are governed not only by the laws of everyday chemistry but also by the paradoxical principles of quantum electrodynamics. When we probe to these levels of the body, our practical questions take on seemingly metaphysical overtones. How does a thinking, feeling, creative, intelligent human being arise from the fog of quantum particles? Where is the boundary at which the deterministic laws of chemistry give way to the quirky, probabilistic laws of quantum physics? At what level of being does illness first gain its foothold—at the quantum level of electron and photons or only at the level of deoxyribonucleic acid (DNA) and cells? Is there such a thing as “quantum health,” and if so, do we have any influence over it? Which mechanisms shift our bodies form health to illness and back toward health? These are among the myriad questions that are prompting researchers in biology and medicine to forge boldly forward, extending our understanding of how the body works and creating a new kind of health care in the process. Nutri-Energetics Systems (NES) the acronym NES is pronounced to rhyme with “TESS”—the system of health care that is the result of Peter Fraser’s decades of research and his collaboration with Harry Massey—is pioneering this twenty-first-century health revolution. Their model of the human body-field integrates physics and biology to reveal a stunning new vision of how the body works. Peter’s research over the past twenty-five years has expanded our understanding of how the body has two interdependent aspects: the biochemical (which is the basis of most modern Western medicine) and the bioenergetic (which has been the province of alternative and complementary medicine). The body and its physiology are stimulated by fields of energy, called Energetic Drivers in NES that arise from the organs as a fetus develops. Meridian-like channels, called Energetic Integrators in NES, coordinate the information that drives millions of chemical processes, ensuring that the correct information gets to a specific place in the body at the precise time it is needed. Bioenergetic fields, called Energetic Terrains in NES, form environments in tissues to which pathogens and microbes, such as viruses and bacteria, are attracted if we are exposed to them. Energetic Stars form mini networks of information routes in the body-field that address distortions correlated to specific physiological issues. According to the NES model, everything that means anything in the physical body in terms of health has its energetic and informational counterparts. We can detect, monitor, and change the energetic environment of our body and so can directly influence the state of our health. Throughout history, mystics and healers have claimed that we are “energy beings.” The history of this belief is recounted in countless books and websites, so we will not review it here. Readers who are motivated to review this long history can start with traditional Chinese medicine and Indian ayurvedic system. There are scores of individual pioneers and visionaries, both ancient and modern, who have devoted themselves to furthering our understanding of the underlying energies of the body. The modern physicians, scientists, and researchers include Edwin Babbitt, Harold Saxon Burr, Albert Szent-Gyorgyi, Ryke Geerd Hamer, Royal Rife, Samuel Hahnemann, Reinholdt Voll, Helmut Schimmel, Wilhelm Reich, Ida Rolf, Robert O. Becker, Freeman Cope, Herbert Frohlich, James Oschman, Fritz-Albert Popp, Mae-Wan Ho, Walter Schempp, Peter Marcer, Edgar Mitchell, William Tiller, Candace Pert, and Bruce Lipton, to name only a few. Most of the research into biophysics has been more or less piecemeal, with researchers inquiring into one small aspect or another of the bioenergetics of the body. There have been few attempts to fashion an integrative model of our energetic physiology, which in NES we call the human body-field. The closest model is that of traditional Chinese medicine. However, for all its detail, even the Chinese system does not make clear connections to the modern biochemical understanding of the body. The NES model of the human body-field provides the first truly comprehensive and coherent link between biochemistry and bioenergetics. NES is a system that is holistic in the best sense of that word. We don’t reject the very real biochemical processes of the body. We don’t reject the value of allopathic medicine, which is built upon that biochemical framework. However, we are showing that there is more to the body than chemistry. There is a complex energy system that serves as a master control system for the biochemical body. To be truly healthy—to achieve long-lasting wellness—we need to correct distortions and blockages in the complex energy structure that is the human body-field. 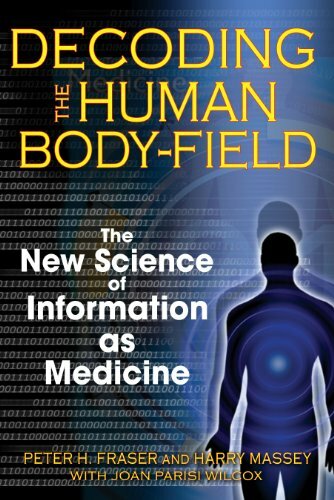 The human body-field is a self-organizing, self-directed, intelligent system that directs the information flow of the body, information that is crucial to the genetic, chemical, and physiological processes of the body. To understand the NES model of the body-field biology, in you have to unlearn in a sense. You have to put aside your focus on the diagnosis of disease based on symptomology. Symptoms are a consequence of the breakdown of biochemistry. However, chemistry is driven by the interaction of subatomic particles and waves. The root cause of disease, as most complementary practitioners will tell you, is at the level of the energy and information of your body. NES research to date allows us to describe a model of the human body-field in detail and to determine how it is functioning—how well or poorly it is managing the energy and information that determine the biochemistry of your body. We have created a biotechnology called the NES-Professional System that detects problems in the body-field and determines both their severity and their priority for correction. We also have created a line of encoded liquid remedies, which we call Infoceuticals that can directly influence the body-field, correcting how it processes the information vital to the physical body. The result is a novel system of healing that works in concert with the biochemical system of the body and that directly engages the body’s own self-healing capabilities. Although a tremendous amount of research remains to be done, we believe that he NES model of the human body-field represents the dawning of a new era in health care, that our theory details the bioenergetic systems of the body more precisely than any other theory, and that our system for correcting body-field errors is more direct than any other modality, biotechnology, or remedy. The NES model of the human body-field is based upon the following ten premises. You can use this as a general outline of the main aspects of NES. The universe is an interconnected network of information and energy. The human body is part of this web of relationships (via feedback loops), and our health is dependent upon the body’s correct processing of this information and energy. Although genetics and cellular chemistry are important facets of how the body works. There is a deeper reality to the body, one in which physics, especially the field of quantum electrodynamics, governs physiology. The interaction of quantum waves imparts energy and information that is encoded in what NES calls the human body-field, which serves as a holographic template for the physical body. Information is directed in the body via many kinds of energy, including electromagnetic and vibrational (as phonons, the quantum aspect of sound) energies, and via frequency and phase relationships. As an embryo develops, the organs create Energetic Driver fields, which impart constitutional energy and information to the body field, and hence to the body. There are at least twelve Energetic Integrator fields, which form a comprehensive communication network in the body-field that directs information to the right place in the body at the right time so that the body functions correctly. Energetic Terrains are energetic disturbances in specific body tissues that create environments hospitable to microorganisms, such as viruses and bacteria, both real and virtual (microorganism’s energy field, rather than the actual microorganism). They can be highly disruptive to the body-field. Symptoms of illness, whether physical or emotional, arise first not in the physical body but as distortions or blocks in the underlying energy and information of the human body-field. 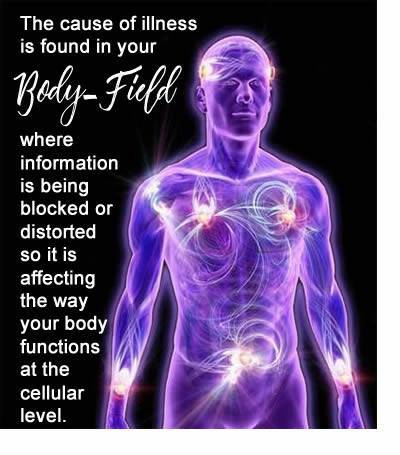 It is possible to analyze the holographic human body-field to determine if there are distortions in or blocks to the flow of energy and information that affect the state of your health. Substances and liquids can be encoded or imprinted with information to influence the energetic state of the body-field, and hence of the physical body. The NES Infoceuticals are created according to this principle. Correcting distortions in the human body-field can help return the body to homeostasis, which refers to the body’s ability to maintain equilibrium, a process that is dependent on the body’s own self-healing intelligence. For most readers, the difficulties will come in believing that so much can take place in their bodies at so infinitesimal a scale. To help readers make the shift from the familiar to the unfamiliar as effortlessly as possible, we will begin our journey by taking you on a tour of your body, into the awe-inspiring interior spaces of yourself. You will see that when we say there is so much more to you than you may imagine, we are speaking quite literally. Then we will introduce you, in nontechnical terms, to the basics of quantum physics, because the human body-field appears to be governed by quantum processes. Finally, we will review some of the intriguing research into the energies of the body and the energetic aspects of health. Our research—and research the world over—into the human body-field is still very much in its infancy, and yet it revel as a body that is awe-inspiring in its use of the energies of nature. Parts 2 and 3 are devoted exclusively to detailing the NES model of the human body-field and the NES system of health care. We hope that this information will educate you about what health truly is and how NES might help you maintain long-term wellness. We also hope that his new knowledge will help you cultivate a deeper appreciation for the grandeur of your body and body-field. Part 2 recounts how NES grew out of our own needs, for we both were seriously ill and unable to find lasting help form either allopathic or complementary medicine. We then recount Peter’s long, and so often perplexing, journey toward understanding the true nature of the human body-field and its role in health. We end part 2 by relating how Harry’s vision and Peter’s research came together to inspire the creation of Nutri-Energetics. In part 3, we detail the varied aspects of the NES model of bioenergetic health and recount the stories of many of the thousands of people worldwide who have been helped by NES. We would like to close this introduction by reminding readers that no matter what beliefs they currently hold about what their bodies are made of and how healing works, nature always has the last word! Her truth will eventually be our truth. All that is required is that scientists, researchers, and healers be willing to follow where nature leads. However, as is so often the case in the history of science and medicine, just when scientists and researchers think they have it all figured out—when they think they are on the cusp of that coveted “theory of everything”—nature reveals that she has more secrets waiting to be unveiled. For all of the progress we have made in deciphering the intricacies of the human body-field, we know that we have only gleaned insight into the rudimentary aspects of it. We encourage other researchers to explore the implications of NES and of bioenergetics in general, and we urge health care practitioners and clients to put our system to the test, because we are confident that NES represents a true breakthrough in healing. A classic hallmark that a theory has hit on a fundamental truth of nature is that it explains how a higher-level order emerges from apparently random and even seemingly chaotic lower-level processes. NES is such a theory. The bioenergetic logic that nature has revealed through Peter’s experiments is more than beautiful, it is elegant. It is complex, but that complexity orders itself into a holistic, structured whole that reveals an overarching simplicity. Even though we have grasped only a small part of the larger picture, the implications for health care from what we have uncovered are staggering, and the opportunities for research are rich almost beyond measure. Most important, however, is the fact that NES works, as thousands of clients can attest. It is not perfect. No health care or wellness system is. However by using NES, you can directly engage your body’s self-healing intelligence in very specific ways. The NES approach to well-being is rooted not in the body but in the various energies and information networks of nature that are expressed in the body. It provides us a novel way to experience the interconnectedness of the cosmos through the medium of our own bodies. The universal energies flow through us. They are not metaphysical energies but appear to be the fields and forces of the real world, of nature. The NES-Professional System provides us the opportunity to quickly and accurately analyze the state of our own body-field and, by using the Infoceuticals, directly change the state of our energy to improve health if we are ill or bolster our ability to stay well if we already are healthy. Thousands of people have discovered NES and are benefiting from it, and we take this opportunity to offer them our gratitude, for without them our research would not have progressed so quickly and our model of the human body-field would not be as fully realized. (Get the book send a email to ddavisfoulks@gmail.com if you wish to order the book from me) Thank you for assisting with my self-health care programs. When fear knocks at the door of your mind, or when worry, anxiety, and doubt cross your mind, behold your vision, your goal. Think of the infinite power within your subconscious mind, which you can generate by your thinking and imagining, and this will give you confidence, power, and courage. Keep on, persevere, until the day breaks, and the shadows flee away. The solution lies within the problem. The answer is in every question. Infinite intelligence responds to you as you call upon it with faith and confidence. ​Habit is the function of your subconscious mind. There is no greater evidence of the marvelous power of your subconscious than the force and sway habit holds in your life. You are a creature of habit. You form habit patterns in your subconscious mind by repeating a thought and act over and over again until it establishes tracks in the subconscious mind and become automatic, such as swimming, dancing, typing, walking, driving your care, etc. You have freedom to choose. You can choose a good habit or a bad habit. Meditation, prayer, being still is a good habit. Whatever mental picture, backed by faith, you behold in your conscious mind; your subconscious mind will bring to pass.